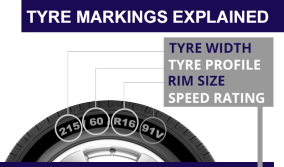 Car Clinic MOT Centre stock a range of Firestone tyres to suit all kinds of vehicle. A robust SUV tyre built to go the distance thanks to its outstanding grip, stability and economy. A peaceful and relaxing ride with outstanding safety and reliability on the road. Fun to drive. Precise steering, excellent cornering and a bit more bite when it’s needed. Available with Run-Flat Technology (RFT).